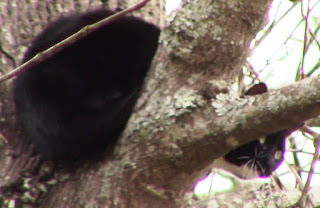 I have a good friend by the name of Bob Reese who is an excellent treetop cat rescuer in Mississippi. 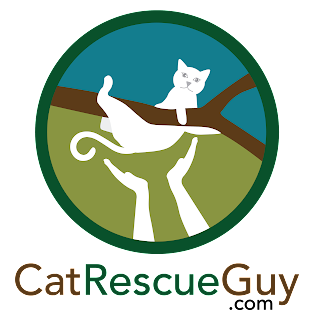 In fact, he is the only cat rescuer in the whole state, and he gets calls to rescue cats all over the state. He lives in Starkville and is willing to drive anywhere within a three-hour radius to rescue a kitty in need. Sometimes, however, he gets calls for cats in the southern part of the state that are closer to me than him. Such was the case when he got a call for a cat stuck in a tree in Brookhaven. That is a three-hour drive for him and he was having an especially demanding day at work. Since the drive there would be less than two hours for me, he asked me if I wanted to take it. Since I am retired, I don't have to take time off work for a kitty rescue, so I was free and able and told him, "yes." After getting all the essential information, I drove there to find a black and white cat perched about 30 feet high in a tree in the front yard of a pretty home. The homeowner, Emily, told me that no one knows the cat, and it has been in the tree for at least three days. Emily's three adorable daughters all told me the whole story about how they found it and have been trying to get it to come down. The cat was less than halfway up the tree, and the tree had many good branches to use to set my rope. I was hoping that this unknown cat was a tame, friendly and cooperative cat, but if it was afraid of me, she could climb all the way to the top of the tree to get away from me. I picked a branch 45 feet high to set my rope. While I was setting up, the cat climbed up about six feet higher. That was not a good sign, but my rope would still be in a good position to continue. I finished setting up, and she did not move any higher or lower. I climbed slowly up to her, and she continued to stay in her position. When I got close, I stopped and talked to her, and she talked back with a relaxed voice. This was looking better now. I pulled myself up a little higher and reached my hand out to her. She sniffed it without alarm and let me touch her gently on the cheek. Now I felt good about this cat and expected her to be cooperative. I continued to build on our relationship until she let me pet her all over. She was pushing her head into my hand and was clearly a tame and friendly cat. I wanted to bring her down in the carrier, so I opened a can of food to use to lure her inside. While I was getting the food ready, she suddenly decided to go out an upward sloping branch about five feet. I don't know why she did that. She wasn't scared of me, and I don't think I did anything to spook her. She was just beyond my reach, but when I reached out my hand, she reached her paw, with claws extended, out to grab my hand and pull it closer. Every time I tried to pull my hand back, she would try to pull it back to her. At first I thought that she could come back down the slope of the branch to me, but it was just steep enough that she could not do that comfortably, especially since the bark was fairly smooth there. I pulled myself up a little higher so that I could reach her better. Then I put my gloved bag on my hand. Again we had a little love fest there, but every time I tried to get my hand in position over her scruff, she would pull back a bit. After a minute or two of this, I finally got a good grip on her scruff and picked her up. I pulled the bag down over her and secured her inside. She didn't complain one bit. I brought her down, and Emily and her little girls led me to the room where they wanted to release the cat. I set her down gently on the floor and slowly pulled the bag down until her head was exposed. She looked around the room and quickly jumped out of the bag. She went straight for the bowl of food and started eating. She stopped every minute or so to go around to each of us for a little contact. She arched her back and rubbed on each of us as she passed, then she went back to the food. Everyone had a chance to pet her, and she eventually finished eating the whole bowl. One of the girls said she was a lucky cat and that we should call her Lucky. So, Lucky it is. I scanned her for a microchip but did not find one. 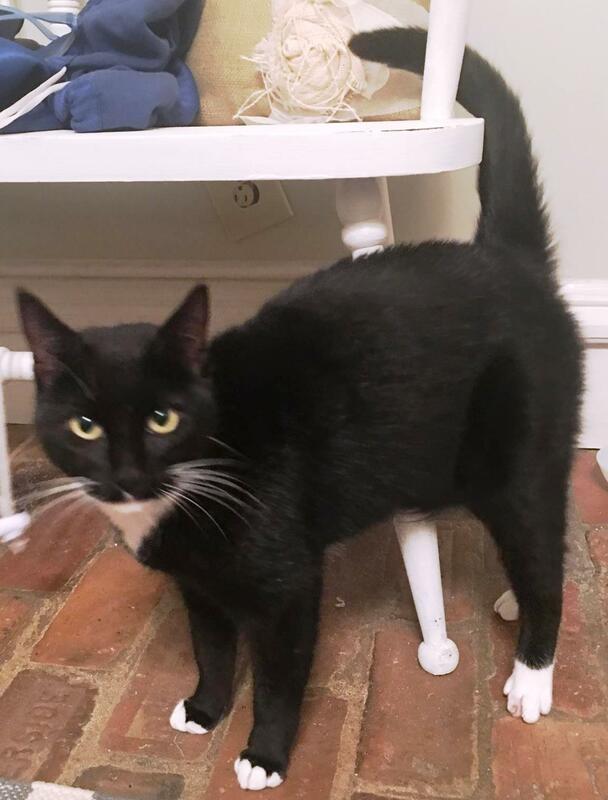 Since this cat was clearly tame, Emily said she would try to find the owner, but they would keep her and care for her until that time. The next day, Lucky was still doing fine and was very happy to be where she was. So if no owner is found, it may turn out that Emily and her three girls will also be lucky to keep her. Time will tell. My video camera troubles continue. This time, however, it was not my fault. I turned on the camera, but, unbeknownst to me, the camera started and then malfunctioned and turned itself off. Since it is on my helmet, I can't see it to know that. I'm very disappointed, because I would have loved to show how cute, sweet and happy this cat was when she finally realized she was down and in a good place. So you will just have to take my word for it. She was a cute and very happy kitty.